May is one of my favorite months. It starts with Beltane, which for me means several days spent in the woods and the fields. Mother’s Day comes ten days after that, which is another celebration. The next weekend is my birthday. May ends with Memorial Day weekend. Many regard the Memorial Day weekend as the start of the summer season but really, the entire month of May can be a celebration of the start of summer and the growing power of the sun. I personally claim it as my own party month like the taurine that I am. Every day is a holiday. If you’re having a party, you must have presents. Any one of May’s holidays is an excellent one. May is one of my favorite months. It starts with Beltane, which for me means several days spent in the woods and the fields. Mother’s Day comes ten days after that, which is another celebration. The next weekend is my birthday. May ends with Memorial Day weekend. Many regard the Memorial Day weekend as the start of the summer season but really, the entire month of May can be a celebration of the excuse to buy myself or a loved one a lovely gift. I usually buy myself at least one book for my birthday – usually more three or four! This year I know that I definitely want The Fortune-Telling Book: The Encyclopedia of divination and Soothsaying by Raymond Buckland (Detroit: Visible Ink Press, 2003). I got it out from the library over a month ago and I’ve renewed it twice. I don’t want to take it back! If you’re having a party, you must have presents. Any one of May’s holidays is an excellent excuse to buy myself or a loved one a lovely gift. I usually buy myself at least one book for my birthday – usually more three or four! This year I know that I definitely want The Fortune-Telling Book: The Encyclopedia of divination and Soothsaying by Raymond Buckland (Detroit: Visible Ink Press, 2003). Like Sasha Fenton’s The Fortune-Teller’s Workbook: A Practical Introduction to the World of divination, Buckland includes all the usual forms of divination: Bibliomancy, Cartomancy, The I-Ching, Palmistry, Runes, and The Tarot, just to name a few. But this is an encyclopedia of over 550 pages, and there is so much more here than the usual how-to find your fortune and future. The Introduction alone is worth a good study. It gives a basic history of divination and the basic forms of divination, citing the Greeks and Romans and the Bible. Buckland praises the Gypsies for being “specialists” in the field of prophecy. (xii) He also stresses that human life is not “written in stone” and whatever is seen in one’s divining can always be changed; indeed, isn’t that the reason for seeking out a psychic to read one’s fortune in the first place? (xiii) He writes, “If, from a reading, indications are that something negative is going to happen, then it behooves that individual to focus his or her attention on the turning events and ensure that the negative does not happen.” (xiii, italics original). This I consider to be very good advice indeed. The book itself is divided up alphabetically, like most encyclopedias, so it’s easy to find what you are looking for. But it’s fun just to browse through it, opening it here or there, and reading whatever you find. There is so much packed into this book! There’s something interesting on every page. In addition to presenting methods of divination, Buckland profiles famous occult figures such as Evangeline Adams, John Dee, Edgar Cayce, and many others. There are separate entries for animals, such as ravens and crows or groundhogs; there are thorough explanations for candle magic and using crystals for divination and how to make sure you have the correct color for the query. The book is literally filled with pictures and charts. Anyone would be happy to receive this fabulous book for their birthday. I didn’t know anything about Raymond Buckland before I read this book. Of course I had heard of him and seen his books before this, but never had read any of them. His website is here http://raymondbucklandbooks.com/bio.php. He is quite prolific. His novels sound very interesting. As far as The Fortune-Telling Book: The Encyclopedia of divination and Soothsaying, I can’t recommend it enough. It’s fabulous. It’s on my list for sure. Go to your library, go to your local bookstore, go Amazon.com or wherever you get your books but look for this treasure-chest of knowledge. You won’t regret it! Buckland, Raymond. 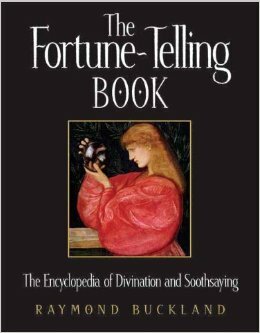 The Fortune-Telling Book: The Encyclopedia of divination and Soothsaying. Detroit: Visible Ink Press, 2003.